Plow is not new. But there are some spots in the city that warrant constant discussion well after opening day; Plow is one such place. 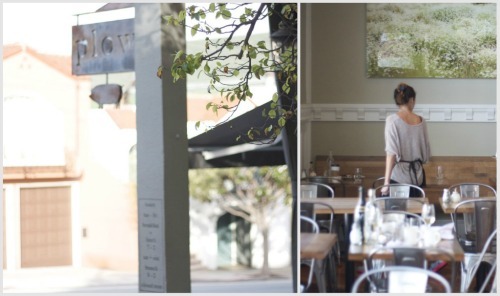 In April 2010, Joel Bleskacek and Maxine Siu, ex-Oliveto folks, decided to take the plunge and open a small restaurant in their Potrero Hill neighborhood. It is a warm, bustling spot at the base of the hill with a handsome bar, a number of cozy tables and tons of natural light. The wait can be long on a Saturday or Sunday but the staff is upbeat and attentive and they do an amazing job of making everyone feel at home. I visited Plow on a recent Saturday with a few friends. We dutifully put our names on the list, were told the wait would be an hour-and-a-half, and took a seat on one of the outdoor benches to catch up. When it seemed liked we were just at the hunger-breaking-point, our names were called and we headed inside to claim a table. The food at Plow is decidedly simple; most of the ingredients are sourced from local farms and it's the kind of menu that you curse at first because it makes deciding on just one dish incredibly difficult. From the French toast with poached pears and mascarpone to the lemon ricotta pancakes or cider-brined pork chop -- it's a very tough call. I say start with some Equator coffee and then leave the French toast and pancakes for one of Plow's remarkable egg dishes. Plow does eggs well. Really, really well. And after reading Ruth Reichl's piece in Gilt Taste on How to Make Better Scrambled Eggs, eggs have been on my mind lately. While I was truthfully shocked at the amount of butter Ruth Reichl describes (1 stick of butter/4 eggs), I have a hunch Plow's eggs follow suit. They are light and fluffy, the kind of scrambled eggs you know you just can't replicate at home. 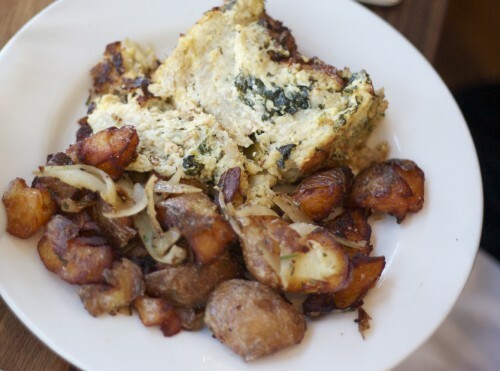 The savory bread pudding has a little warning that it's only available "until it's gone." You know what that means: get there early to snag a piece because they do often sell out. And I can see why. Packed with kale and leeks and a touch of Gruyere, it's hearty but not in a cumbersome, soporific way. Instead, it's actually quite light and really celebrates the vegetables and cheese while avoiding a common mistake of adding too much salt or over-baking. We opted for crispy potatoes instead of the side salad that it's usually served with. Pleasantly salty and, true to their name, crispy as heck these are some of the best breakfast potatoes I've had in quite some time. There's nothing worse than waiting well over an hour in the San Francisco winter wind for a plate of soggy potatoes. That won't be the case here. And then we come to the ultimate in egg celebration: the Eggs Benedict with fennel pollen Hollandaise sauce. While the eggs are poached perfectly here, I did find the English Muffin to be a little spongy for my taste. 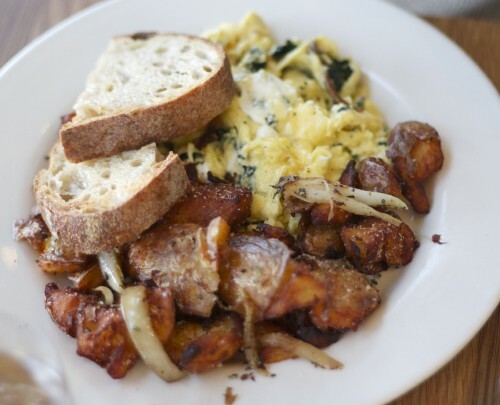 But everything is thoughtfully done at Plow, from the finely chopped chives sprinkled on top of the eggs to the variety of mushrooms or the attentive coffee refills and warm service. And have I mentioned those crispy potatoes? 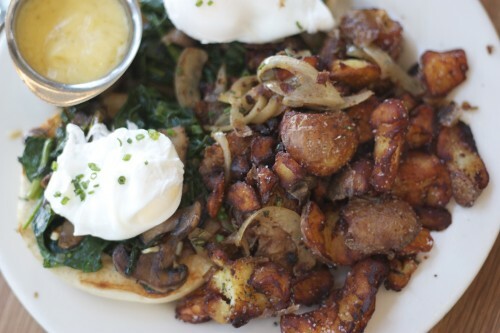 So in short, there are a lot of spots to get brunch in the city. There are the classics, like Brenda's, Foreign Cinema and Absinthe. And then quieter show-stoppers like 15 Romolo or Southern favorite Farmer Brown. But trust me when I tell you: if you're looking for some very special eggs in a very special atmosphere, Plow is where it's at.